Provides researchers with structural information of biomolecules and synthetic biomimetic polymers. Capable of simultaneous data acquisition of parameters such as: Circular Dichroism, Fluorescence, true UV-VIS Absorbance, Temperature and Single/Multi-Wavelength Thermal Melt Analysis, across a wide wavelength range (170-1,150nm). Using the same high-performance UV-VIS-IR avalanche photo-diode detector, it is also possible to configure the instrument for the acquisition of both Linear Dichroism measurements (down to 180nm) and Optical Rotatory Dispersion measurements. The sample compartment contains a single cell Peltier-controlled cell holder which is capable of performing temperature-controlled (ramping) measurements with the ability to acquire Circular Dichroism vs temperature curves at more than one wavelength in a single continuous-temperature-ramping experiment (with the sample temperature recorded for each discrete measurement). 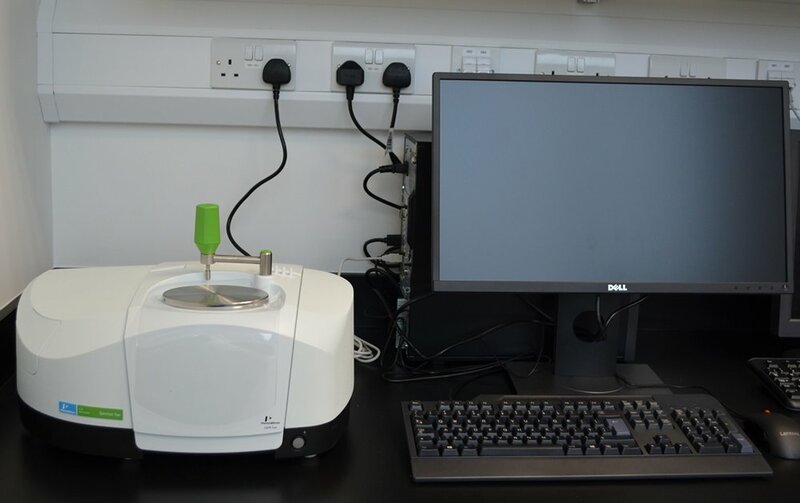 The Perkin Elmer LS 55 luminescence spectrometer is a very versatile instrument that allows measurement of fluorescence, phosphorescence, and chemiluminescence or bioluminescence of a sample. The Model LS 55 Series uses a pulsed Xenon lamp as a source of excitation. The sample is excited from 200 to 800 nm and the emission spectra recorded from 200 to 900 nm. Excitation and emission monochromators can be independently or synchronously scanned, while the Prescan mode is ideal for method development and locating of peak excitation and emission maxima. Shimadzu UV-2600 Spectrometer. Used to facilitate the qualitative and quantitative analysis of compounds which absorb light in the UV-VIS region. This single monochromator, variable slit, double-beam instrument has a standard scanning range of 185-900nm but with the availableShimadzu ISR 2600 Plus Integrating Sphere it can extend the operating range into the near-IR region with an upper limit of 1,400nm. 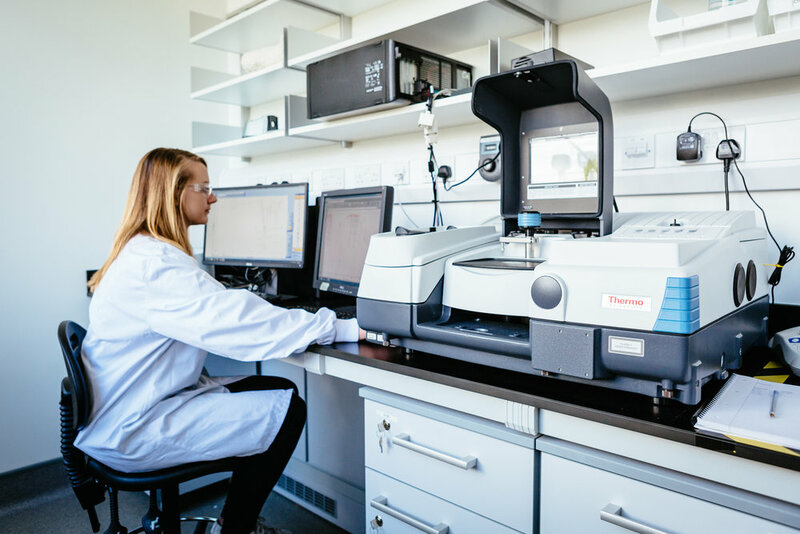 All instrument control & data acquisition is performed through the latest version of the Shimadzu UVProbe software, which includes built-in Validation Software as standard to support GLP/GMP requirements. Highly customisable acquisition Modules - Spectrum, Photometricand Kinetics - also facilitate a wide range of applications. Shimadzu UV-1800 Spectrometer. Used to facilitate the qualitative and quantitative analysis of compounds which absorb light in the UV-VIS region. This single monochromator, fixed slit, double-beam instrument has a standard scanning range of 190-1,100nm. Instrument control & data acquisition can be performed either in stand-alone mode directly via the display panel on the front of the instrument (using a USB flash drive to transfer analysis data) or through the latest version of the Shimadzu UVProbe software, which includes built-in Validation Software as standard to support GLP/GMP requirements. Highly customisable acquisition Modules (Spectrum, Photometric and Kinetics) also facilitate a wide range of applications. The Spectrum Two is suitable for a wide range of applications and includes a high performance detector, a standard sample compartment with sample slide mount and the comprehensive Spectrum 10™, and Spectrum 10™ Upgrade software interfaces. The system has a source range of 350 - 8,300 cm-1 and a diamond universal ATR accessory. Detector range: 350 – 12,500 cm-1.